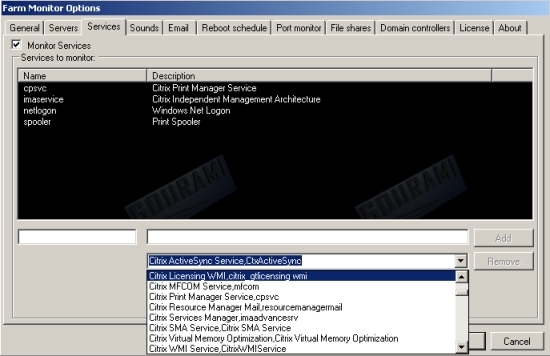 Farm Monitor is a utility that can be used to monitor the basic functions of your Citrix servers. Gourami released this product for a limited time for free. Only registration is required for getting a license to run the product continuesly. In this Glance at Free article I will take a look at this product. The product needs to be installed on one of the Citrix server in the farm. Depended of the way applications are assigned to user you need to determine which server would be used. The product can play sound alarms or e-mail when there are alerts, but most system administrators would like to see the utility it selves (just like other monitor programs). On the Citrix server .net Framework 2.0 needs to be present. The software needs to be started by a user which is domain admin and needs to have full Citrix admin rights within. The installation is really basic the only thing you need to specify is the destination location of the utility. During the first time the application is started you will be forwarded to the Gourami website for registration. Via this way the Citrix Farm name is already filled in (the product is licensed per Citrix farm) and is the easiest way for the registration. The license code is send via e-mail and after filling the license code within the product we are ready for the configuration steps. The whole configuration is available within the options part within the application. The options part exist of several tabs. On the General tab you can configure the scan interval, the ping timeout and the logging settings to disk. The tool automatically detects the datastore, license server and data collector, but if needed these servers can be specified manually on the servers tabs. On the services tab you can specify which services running on the Citrix servers need to monitored via the product. It's a pity that in my test environment the CTX XML service is not available as an option to monitor. Also all services configured will be monitored for all servers, it would be nice if you can make different profiles. The tool can report errors using sound and e-mail alerts, which are configurable on the Sound and E-mail tabs. Most Citrix Servers are restarted periodically within a specific time frame. If this is the case in your infrastructure you can specify this time window at the Reboot Schedule tab, so the tool will not report issues between those times. If you do not use the default ICA and RDP port, you can specify the ports on the Port Monitor tab (you can also enable/disable this component). The tool can also monitor some very close related subjects. On the tabs File Shares and Domain Controllers those options can be enabled and configured accordingly. When the configuration is completely the tools will show the status of the datastore, license and data collectors. This is done using 4 possible statuses (showed with a different color): Online (green), Warning (yellow), Undetermined (gray) and Error (red). The same colors are being used for showing the status of the servers within the Farm combined with some information of the server. When the server displays an error you can select the server (also when there is no error actually) and the error will be displayed. In below displayed figure the Citrix Print Manager Service is stopped. In the same window some information is displayed and the current sessions running on this server. Farm Monitor also logs all events in a log on the local disk for a bit more specific information. Farm Monitor is real nice utility for infrastructures where no monitor software product is implemented and you would like to have more additional information Citrix Resource Manager is supplying (mostly based on availability of ports, services and servers). It's a pity that there is no option to create separate monitor profiles and that the Citrix XML service cannot be monitored. The interface is easy and simple and displays in a orderly way the status of the most critical components, so be quick and download (and register) this tool quickly. Add-on: After contact with Gourami you can add every service you would like to monitor. The presented servers are just a preset of possibilities. 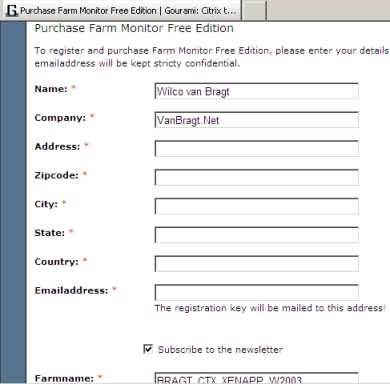 Especially for the VanBragt.Net SBC & Virtualization Centre visitors the offer for a free version of farm monitor is extended to 04-2010. Click here to use this exclusive offer to get farm monitor still for free.